On Scorpion Season 4 Episode 14, Walter helps Sly out with his public access science show, and thus, Walt's Whiz Kidz is born! Walter struggles to teach them the science behind a safe and successful egg drop. While Walter, Paige, and Sly are focused on making sure Walter's science show is a success, Cabe goes off on a romantic weekend with Allie. The problem is he shows up at the lighthouse when it's actually Toby and Happy's weekend there. Yeah, it's awkward. Don't worry, a lovely solar storm knocks out the power and all communication in Los Angeles, giving the team something else to focus on. Using Sly's ham radio, Walter is able to reach Homeland Security where he learns that there's a private airplane that's unaccounted for. Walter volunteers Team Scorpion to help locate this plane and land it safely. Thanks to Sly's math and birdroni, Team Scorpion is able to make contact with the two teenagers on the plane: Griffin and Rachel. Cabe, Allie, Toby, and Happy get the lighthouse up and running, using it as a beacon to guide the plane to them. It works, but getting the plane to land safely ends up being an issue. 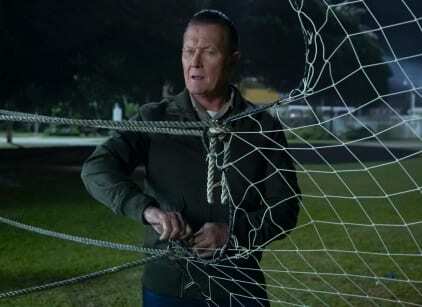 After the plane hits some debris on Griffin's first attempt at a descent, Team Scorpion has to get creative with how to get Griffin and Rachel safely on the ground. Lucky for them, Walt's Whiz Kidz are there to help! Meatball, yes that's the name he chooses to go by, asks Walter why Griffin and Rachel don't just jump out of their plane if it's going to crash. The day is saved thanks to a net, Sly's precise calculations, and Meatball's genius idea.